Aluminium anti-corrosive folding frame. 20" seat width, max user weight 130kg. 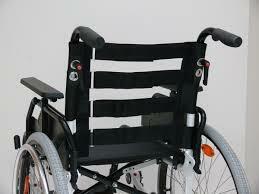 Padded adjustable height arm rests, adjustable height rear handles with handbrakes (not shown in image). Adjustable comfort back rest (velcro). 24" solid tyres, 7" front rubber tyres. 4 stage seat adjustment, hard wearing nylon upholstery. 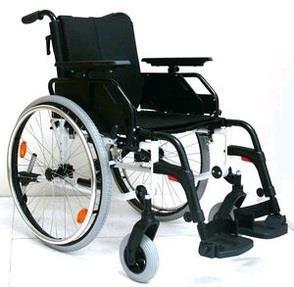 Height & angle adjustable foot plates, easy to operate lever swing away leg rests, manual brake on rear wheels, quick disconnect rear wheels, anti-tip wheels fitted. Also available in standard 18" seat width, and without handbrakes upon request.